While the Renaissance was happening in Italy, great artistic and social changes occurred in Germany and the Low Countries. A bias in favor of Italian art among earlier generalizations of scholars made Italy the focus of artistic invention and the Northern Renaissance a less sophisticated imitation of the real thing. One might debate whether the North experienced a Renaissance, but the artistic, institutional, and intellectual changes are evident. Albrecht Dürer is the indisputable rock star of the German Renaissance. 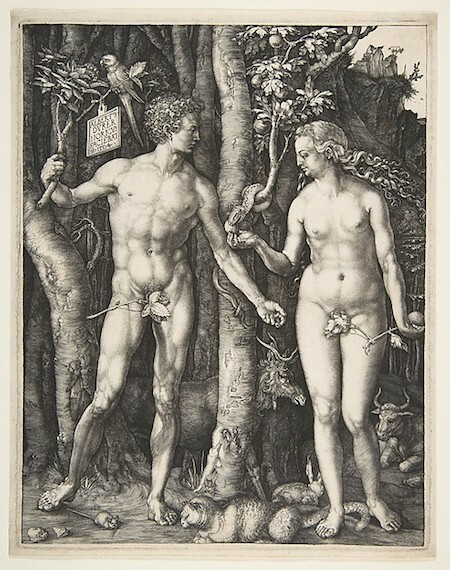 In addition to being a successful painter, Dürer built his reputation on his prints, both woodcut and engravings. Because prints can be made in multiples, he had an unusually broad audience. Mechanically reproducible media such as woodcuts and engraving not only helped Dürer disperse his ideas, they also made it possible for Northern artists to see Italian art without traveling. Dürer likely had his first exposure to Italian art in Germany, in woodcut or engraved copies of Italian works. Looking at an Italian work of art in Germany may seem unremarkable to us. However, until prints were available all works of art were one of a kind, and the only way to see a new work of art was to travel. Prints were typically far less expensive than paintings and much lighter and therefore more portable. The switch from one-of-a-kind works of art to prints is in some ways comparable to the switch from buying or borrowing picture books to searching for images on Google. 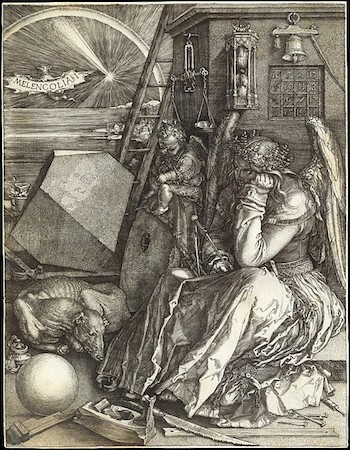 Among Dürer’s best-loved works is the engraving Melencholia I, 1514, which depicts the personification of melancholy, the temperament associated with artistic inspiration. The picture of the brooding figure, whose face resembles Dürer’s famous self portraits, may be male or female. Some scholars believe Dürer’s self portraits are androgenous. Though the face may be Dürer’s, the garment looks feminine. Whatever the gender, the figure experiences the dreadful feeling of writer’s block. Surrounded by all the tools needed to create—a compass, a plane, nails—s/he sits still, head in hand, and does nothing. The wings are a painful reminder of our limitations. Gifted with intelligence, imagination, and the desire to soar, the figure’s small wings cannot lift such a weighty and substantial body. Bound up with the idea of frustrated creativity is the notion of creativity itself—which took on its present meaning during the Renaissance. The space is like a fun house, never offering the viewer an opportunity to become oriented. Are we inside or outside? Where does the ladder start? Where does it lead to? The rhombohedron blocks the horizon, and all of the edges point out of the image, a seeming play of the logical system of horizon and orthogonal that create a unified space. Perhaps the most influential aspect of the Northern Renaissance is the combination of printed image with text together in books. The printing press was invented in Germany around 1450. Until the printing press, books were laboriously copied and illustrated by hand, one at a time. The combination of printed words and images created an explosion of information (rather like the change from typewriters to computers). The printing of books such as Luther’s translation of scripture and illustrated polemical pamphlets accelerated the Protestant Reformation, a movement that re-aligned religious and national boundaries, and ultimately would motivate migration to the New World. Cite this page as: Dr. Bonnie Noble, "An introduction to the Northern Renaissance in the sixteenth century," in Smarthistory, August 9, 2015, accessed April 20, 2019, https://smarthistory.org/an-introduction-to-the-northern-renaissance-in-the-sixteenth-century/.